De Colores: The Raza Experience in Books for Children: Cinco de Mouse-O! His eyes grew round as he beheld a confetti-covered piñata, stuffed with candy and shaped like a burro, hanging in a tree above the plaza. “I must have that for my fiesta,” he said to himself. OK, let’s get relatively real here. Piñatas are not covered with “confetti”—they’re made with fringed and wrapped crepe paper. Even though Mouse is anthropomorphic, house mice are scavengers. They’re also prey animals, so they are very careful to avoid predators, such as cats (who, by the way, are not “greedy.” They kill to eat, and also for the fun of the hunt.) With all the food around a fiesta—“tacos, tamales, chorizos, and flan”—why would Mouse put himself in danger, trying to reach a piñata, “swaying high above the plaza”? And why is Mouse planning his own “fiesta”? None of this makes any biological or cultural sense—even for an anthropomorphic Mexican rodent. The rest of the story is about Mouse, trying to reach the piñata while avoiding Cat. Someone steps on Cat’s tail, Cat runs away, Mouse sadly looks around and—finds an overlooked lemon drop, which he picks up and takes back to his “hidey-hole.” Here, Mouse, wearing a sombrero and dancing with the lemon drop—amidst papel picado, dried chile peppers, paper flowers, and a Mexican wood carving of what appears to be a cat—and sings out: “¡Cinco de Mouse-O! ¡Qué felicidad! The End. Ebbeler’s heavily saturated, full-bleed, mostly double-spread illustrations—created with acrylic paint, pastels, and colored pencil on paper—portray scenes of the festivities from a variety of perspectives, including one spread in which Mouse is eyeing the piñata. Since mice have non-stereoscopic vision, the piñata appropriately appears twice, on both sides of Mouse’s head. He’s seen in other spreads as well, eyeing the festivities almost in proportion to the humans, such as running over a dancer’s foot, hiding in a mariachi’s sombrero, and riding the piñata like a vaquero. As well, the people—dancers, musicians and vaqueros in “fiesta” outfits, while everyone else wears street clothes—are done well, and Ebbeler portrays the Mexican community as ethnically diverse. In one scene, though, an elderly woman is cooking and a younger woman is serving. The older woman is holding a pair of tongs. Apparently bemused, both women are looking directly at Mouse, who is happily carrying away a tamal, a taco, an entire flan on a plate, and some beans that the server has dropped. He is stealing their food and probably making a mess as well. One of the women would have immediately chased him off, but doesn’t. This is insulting to Mexican people, and particularly to Mexican women. And that Mexican cultural artifacts, such as the piñata, papel picado, and Oaxacan folk art carvings, foreground the actual fiesta, and that Mouse’s wearing regalia and celebrating something that’s referred to only in a brief introductory note on the CIP page, is offensive as well. Cinco de Mayo has historical significance. By ignoring the history—and using a Mexican celebration as the backdrop for a story in which a mouse is the central (actually, only) character—diminishes the festival and diminishes the Mexican culture itself. Further, transmogrifying Cinco de Mayo into “Cinco de Mouse-O” implies that adding an “o” to the end of a word makes it Spanish. To do so mocks the language. 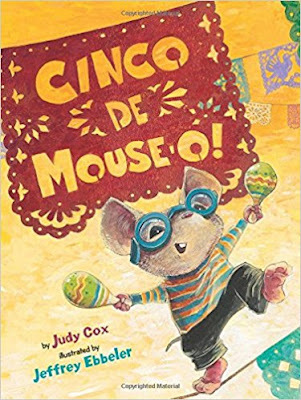 Despite the publisher’s thanking “Lena Burgos-Lafuente of New York University’s Department of Spanish and Portuguese for reviewing the Spanish in this book for accuracy,” the idea that Cinco de Mayo is a mouse’s personal fiesta, which he misnames—is racist. Cinco De Mouse-O! is not recommended. I can't wait to read this to my students. They love the book One Is a Feast For Me by the same author and featuring the same mouse. I feel that adults bring baggage to the reading of picture books meant for a younger audience and forget to let kids be kids. Thank you for your comment, Anonymous. I believe that those of us who produce children’s books have an obligation not to feed our children “pretty little lies” that will ultimately poison them. And those of us who are educators and reviewers have an obligation to call them out whenever we encounter them. CINCO DE MOUSE-O! is full of stereotypes of Mexican people. "Letting kids be kids" does not include giving them things that will hurt them or others.